Discover the world of the multi-award-winning Spider-Man: Into the Spider-Verse in this stunning collection of art. Packed with concept art, final designs, and artist commentary plus previously unseen storyboards. Phil Lord and Christopher Miller, the creative minds behind The Lego Movie and 21 Jump Street, bring their unique talents to a fresh vision of a different Spider-Man Universe, with a groundbreaking visual style that's the first of its kind. Spider-Man: Into the Spider-Verse introduces Brooklyn teen Miles Morales, and the limitless possibilities of the Spider-Verse where more than one wears the mask. Unmasking the artistry behind the hotly-anticipated movie, Spider-Man: Into the Spider-Verse The Art of the Movie contains concept art, sketches, storyboards and will give you fascinating insights into the creative process. 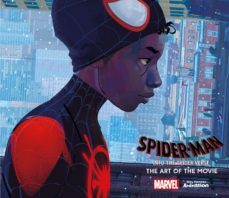 With exclusive commentary from the creators, plus a foreword written by Brian Michael Bendis, this extraordinary collection of art will take readers into the Spider-Verse.